Call it High Line fever: since the first leg of James Corner and Diller Scofidio + Renfro’s High Line debuted in 2009, High Line–like projects have popped up all over the city and across the country. Now, not ten miles from the original, the Bronx may be slated for its very own rail-to-park conversion. The block-long site, bounded by Brook Avenue, East 156th Street, St. Ann’s Avenue, and East 150th Street, is owned by CSX. In order to reclaim the space for parkland, the city would need to buy or seize the land from the railroad company. On a visit to the site in September, Mayor de Blasio deplored the condition of the trash strewn corridor, which doubles as a homeless encampment. Soon after the mayor’s visit, city workers cleared out the belongings of the residents and removed debris from the site. 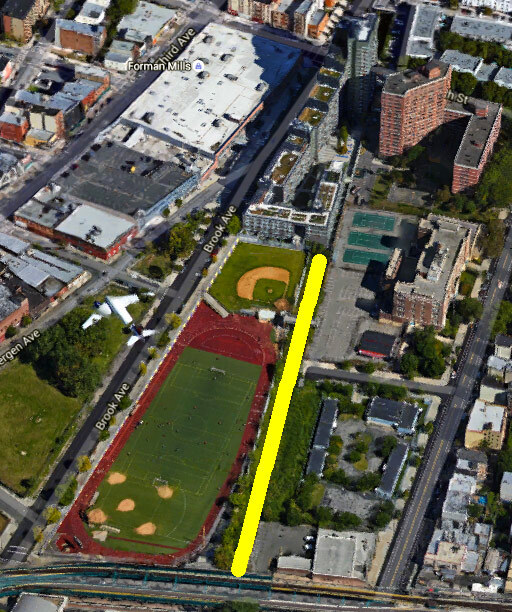 Sandwiched between schools and their athletic fields, the lowline would be adjacent to mixed income housing projects Melrose Commons and Via Verde.